Saraswat Bank joined National Financial Switch (NFS) o­n 15th October 2010 for providing ATM access to our customers across India. 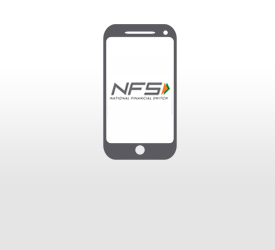 NFS is the network which facilitates routing of ATM transaction through inter connectivity between banks’ switches thereby enabling customers to utilize any ATM of a connected bank. Under this arrangement wide network of ATMs of Nationalised, Foreign, Private and Co-operative Banks are available to our customers using our Bank’s cards, i.e. our ATM card as well as the VISA debit card.